Naturally powerful MediJoint Pain helps relieve the pain of osteoarthritis in the wrist, hand, elbow, shoulder, back, neck, hip, knee, ankle, and foot joints. Adults should take 2 capsules 2 times per day to relieve pain. For the relief of joint pain associated with osteoarthritis, use for a minimum of 2-3 months to see beneficial effects. Warnings: Consult a healthcare practitioner prior to use if you are pregnant or breastfeeding. Consult a healthcare practitioner if symptoms persist or worsen. 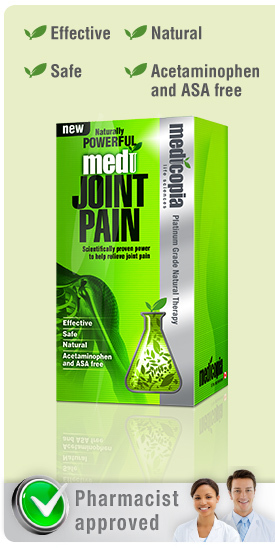 Next >> Why choose MediJoint Pain?